Sahara Hotel and Casino Las Vegas Features all your favorite table games including Craps, Blackjack, Roulette, Mini Baccarat, Let It Ride, Big 6, 4 Card Poker, 3 Card Poker, Texas Hold-Em Bonus, War, Spanish 21 and Pai Gow - with affordable minimums so you can play longer. 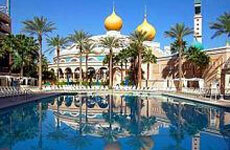 The Sahara Hotel and Casino appreciates the sheer exhilaration, excitement, and entertainment of live casino action. So we've gone to great lengths to feature a diverse selection of traditional games and innovative new twists on gaming. More importantly, we've also developed a casino player's club that offers generous rewards so you receive comps, cash, and other bonuses while you play. 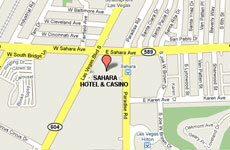 Check our Club Sahara to learn even more. From pennies to $5 machines, we have hundreds of variations, ranging from traditional favorites to the latest graphically exciting multi-line varieties that pay multiple jackpots. More importantly, we try harder by setting many of our slots looser than the average Las Vegas casino. Keno has become a Las Vegas casino tradition in offering another easy and exciting way to play. At the Sahara, we keep this classic game alive, allowing you to play the way you want by deciding how many numbers to pick, the amount of your wager, and winning generous payouts up to $25,000! With poker continuing to grow in popularity, we're proud to offer 16 tables that are open to the casino, but off the hallway to provide a more relaxed, smoke-free atmosphere. Most poker players know this is a great place to play with beginners sometimes making the play a bit wild. Ask about our bad beat jackpot, daily tournaments, and no limit games when you visit. The Sahara Race and Sports Book has come along way from its early beginnings, but we kept what you like best about it. We've maintained low minimums ($5 for sports and $2 races) while adding 24 sports book kiosks so you can sit easy while watching any of our 16 screens, with half featuring sports and the balance with racing.